Deep Creek in the Great Smoky Mountains National Park is renowned for its waterfalls and streams. Hikers can choose from several loop hikes leading to the waterfalls. Mountain bikers can take advantage of one of the few park trails where bicycles are permitted. Hiking: Around 2 miles of walking will acquaint you with beautiful Deep Creek and three pretty waterfalls. Deep Creek area loop hikes include Juney Whank Falls (0.6 mile), Three Waterfalls Loop (2.4 miles), and Deep Creek-Indian Creek Loop (4.4 miles). Longer loop hikes are also possible. Trails to the waterfalls start from the large parking area at the end of Deep Creek Road (across the creek from Deep Creek Campground). Fishing:Pick up fishing regulations at a park visitor center. A North Carolina fishing license is required to fish within park boundaries. A fishing license may be purchased in Bryson City. 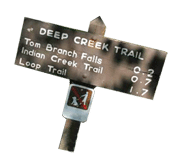 Bicycling: Bicycles are allowed on Deep Creek and Indian Creek trails to the points where the old roadbeds end and the trail treads begin. Camping: Deep Creek campground is open from early April until late October. Group camping is also available. Reservations are available by calling (877) 444-6777. Picnicking: There is a sizable picnic area with restrooms and changing rooms available. The picnic area is open year-round. The pavilion may be reserved by calling (877) 444-6777. Directions:To get to Deep Creek, head to Bryson City, NC and follow the signs three miles to Deep Creek. Find your dream home on Fontana Lake or build your own. Be a part of the growing communities surrounding Fontana Lake. NOTE: Effective July 1, 2001, in every real estate sales transaction, a real estate agent shall, at first substantial contact directly with a prospective buyer or seller, provide the prospective buyer or seller with the following information [NC Real Estate Commission Rule 21 NCAC 58A.0104(c)].